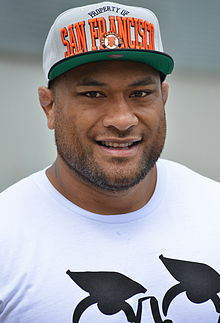 Neemia Stanley Tialata (born 15 July 1982 in Lower Hutt, New Zealand) is a New Zealand rugby union footballer. He currently plays for Stade Toulousain in the Top 14. As well as representing New Zealand from 2005 - 2010, he also played for the Hurricanes in Super Rugby and for Wellington in the ITM/Air New Zealand Cup when available. Tialata was born in Lower Hutt but moved, when he was one, to American Samoa with his parents who were undergoing religious training in Kanana Fou Theological Seminary. The family returned to their vocation in New Zealand when Tialata was five with his late mother Sipoutasi, late father Rev. Pelema and sisters. He was the only boy and was the third child out of the four. His father died after a year of serving at the CCCAS church in Porirua, New Zealand followed by his mother four years after. Tialata and his three sisters now reside with his aunt whom he now calls his mother (Nu'ulopa) and her five children whom Tialata also now considers his brothers and sisters. ^ "All Blacks: Quartet axed for Tri Nations". NZ Herald. APN Holdings. 27 June 2010. Retrieved 27 June 2010. "Neemia Tialata". hurricanes.co.nz. Archived from the original on 16 September 2007. Retrieved 27 May 2007.